"I'm honored and delighted to learn that my novel Homeland has been shortlisted for Canada's Sunburst Award, a juried prize for excellence in speculative fiction. I've won the Sunburst twice before, and this is one of my proudest accomplishments; I'm indebted to the jury for their kindness this year. The other nominees are a very good slate indeed – including Nalo Hopkinson's Sister Mine and Charles de Lint's The Cats of Tanglewood. –Cory Doctorow Cory Doctorow, acclaimed blogger, technology guru and science fiction novelist, will Skype with teens and adults. A continental breakfast will be served and door prizes will be awarded. You do not want to miss this author event! Breakfast will be served at 9 am and the Skype with Doctorow will start at 9:30 am. Seating is limited so register early. For teens and adults. Register online, at the Youth Desk, at the Ask a Librarian Desk, 215 E. Goodwin Street, Prescott, AZ 86303 or call 928.777.1526/1537. Presented with funding from Friends of the Prescott Public Library. Visit the library website for more information. 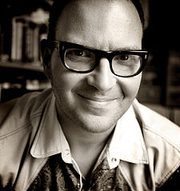 Cory Doctorow is a science fiction novelist, blogger and technology activist. He is the co-editor of the popular weblog Boing Boing (boingboing.net), and a contributor to The Guardian, The New York Times, Publishers Weekly, Wired, and many other newspapers, magazines and websites. He was formerly Director of European Affairs for the Electronic Frontier Foundation (eff.org), a non-profit civil liberties group that defends freedom in technology law, policy, standards and treaties. He holds an honorary doctorate in computer science from the Open University (UK), where he is a Visiting Professor; in 2007, he served as the Fulbright Chair at the Annenberg Center for Public Diplomacy at the University of Southern California. The B.G.P. SOCIAL NETWORK BOOK SOCIETY (ages 16 & up) will discuss Little Brother by Cory Doctorow. This event has been rescheduled from April 27th, our apologies for any inconvenience this may cause. The timely Homeland, sequel to Little Brother, is the latest from Canadian-British blogger, journalist, and science fiction author Cory Doctorow. After his visit as a Clarion instructor, Cory will appear at Comic-Con on Thursday’s “Ode to Nerds” panel. Sci-fi master Cory Doctorow, "Homeland"
Sunday February 24th, 3 p.m.
We are thrilled to bring sci-fi master Cory Doctorow to Gibson's for the sequel to the multi-award winning, New York Times bestselling Little Brother, Homeland. Cory is a science fiction author, activist, journalist and blogger, the author of Tor Teens/HarperCollins UK novels like For the Win and the bestselling Little Brother. He is the co-editor for the popular weblog BoingBoing.net, and runs Craphound.com. He was also the former European director of the Electronic Frontier Foundation and co-founded the UK Open Rights Group. Cory has written for Wired, The Guardian, Publishers Weekly, Make, Locus and others. Born in Toronto, Canada, he now lives in London. Cory Doctorow (craphound.com) is a science fiction novelist, blogger and technology activist. He is the co-editor of the popular weblog Boing Boing (boingboing.net), and a contributor to The Guardian, the New York Times, Publishers Weekly, Wired, and many other newspapers, magazines and websites. He was formerly Director of European Affairs for the Electronic Frontier Foundation (eff.org), a non-profit civil liberties group that defends freedom in technology law, policy, standards and treaties. He is a Visiting Senior Lecturer at Open University (UK) and Scholar in Virtual Residence at the University of Waterloo (Canada); in 2007, he served as the Fulbright Chair at the Annenberg Center for Public Diplomacy at the University of Southern California. Fast-moving, passionate, and as current as next week, Homeland (Tor, $17.99) is every bit the equal of Little Brother—a paean to activism, to courage, to the drive to make the world a better place. Homeland is the the direct sequel to Doctorow's debut Young Adult title Little Brother in which Marcus Yallow finds himself once again risking everything to take on creeping tyranny and surveillance after California's economy collapses. Doctorow is an editor at Boing Boing and writes columns for Make, Information Week, The Guardian online and Locus. He’s been nominated for the Hugo and the Nebula, won the Campbell, was named a top 25 web influencer by Forbes, and a Young Global Leader by the World Economic Forum. He is the smartest speaker we’ve ever heard speak on any topic anywhere. Do not miss this event. Come early. From speculative fiction, deep space adventures, and alternate histories to epic fantasy realms, all who can admit their dorkdom are welcome. Join Joel and Tommy the third Monday of every month at 7PM. This month we will be discussing For the Win by Cory Doctrow. Cory Doctorow is currently considered a "single author." If one or more works are by a distinct, homonymous authors, go ahead and split the author. Cory Doctorow is composed of 10 names. You can examine and separate out names.